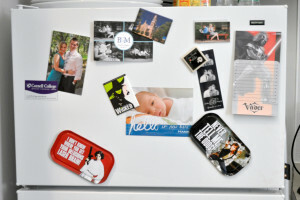 The rest of our kitchen could be sparkling clean, but the fridge would still annoy me with random magnets and photos all askew. My husband will often put some random work calendars or papers on there as well. PLUS, those Star Wars magnets fall down at least once a day. I just want to find a cleaner way to organize that space so it looks nicer but also so it works efficiently for us. 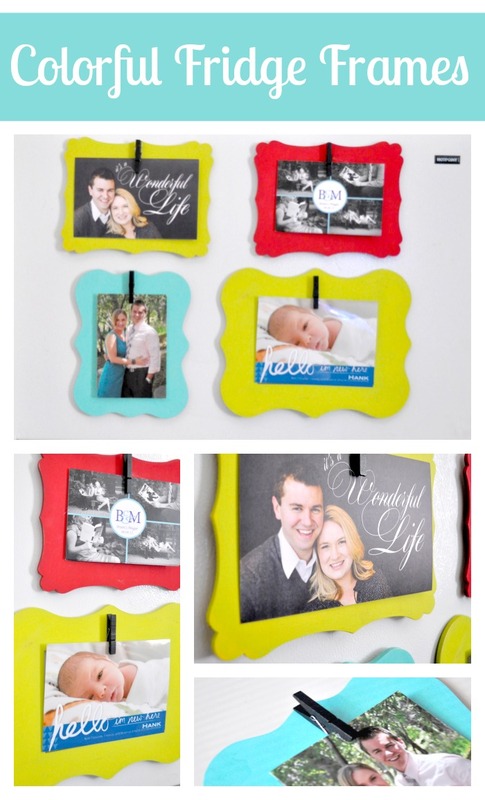 My first project to make that all happen is these Colorful Fridge Frames! First, I wanted frames where I could easily exchange the photographs or cards. Michaels has an awesome selection of wood frames and cut outs, so I bought 4 to start with – 3 4×6 and 1 5×7. Second, I really wanted to add a little color to the fridge. Since we live in an apartment, we can’t paint the walls which means white fridge against white walls and white backsplash. I am always looking for ways to add more color! I also wanted the color to match closely to our dishes. This was an easy process! I took our plates into Lowes and asked them to color match the plates into the small sample size of paint. Those sample sizes are amazing for small projects! They aren’t 100% exact, but really close which is always good enough for me. Third, I painted the front of the frames. Once they were dry, I used sand paper to distress the edges a little to reveal the natural wood color. 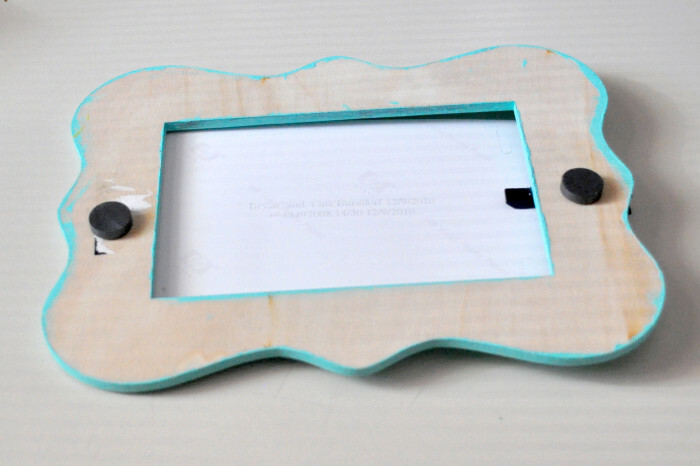 Fourth, using hot glue, I added a small clothespin to the front of the frame where I wanted the picture to hang from. I would suggest making some vertical and some horizontal to give you more options. 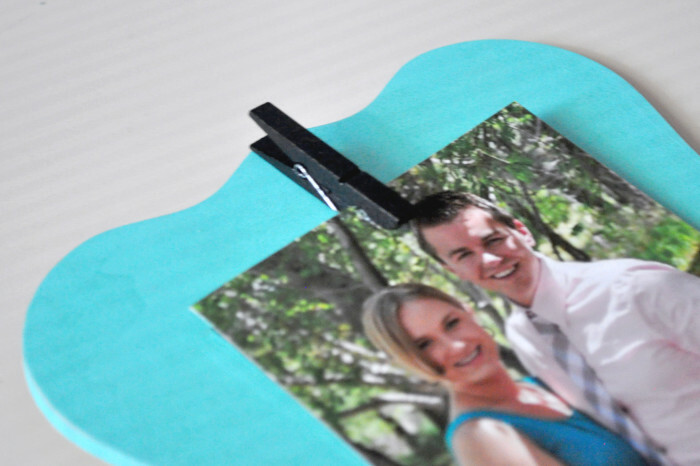 The clothespin holds the picture securely enough to keep a photo straight hanging down but not from the side. Fifth, Flip it over and hot glue the 2 magnets onto the back. 1 magnet at the top would keep the frame on the fridge, but I prefer to have a more secure hold. I don’t want them falling off like the Star Wars magnets did constantly. TA-DA! While it took me forever to see this project through from beginning to end – we are talking at least 3 months – this project is super easy. I have just been so busy and in a bit of a crafting rut. Not anymore! A little paint, a little hot glue for the accessories, and they are ready to hang up. I think I am going to make a couple more. I would really like to find a larger frame that would hold an 8.5×11 piece of paper for when my husband wants to add a schedule to the fridge. Plus, I have a few more kitchen projects in the mix for all of you – new prints, a menu board, and some other fridge decor and organization. Hopefully it will all come together soon! Is there a weird spot in your home that drives you crazy? Very cute, I love mini clothespins, always trying to find new uses for those guys! Oh! I need these! They are absolutely cool! I love looking at pictures when I’m standing over someone’s fridge. I would love these for mine! Those are super cute! I know my fridge can get cluttered with just junk and it drives me nuts! I will have to try these out, thanks! 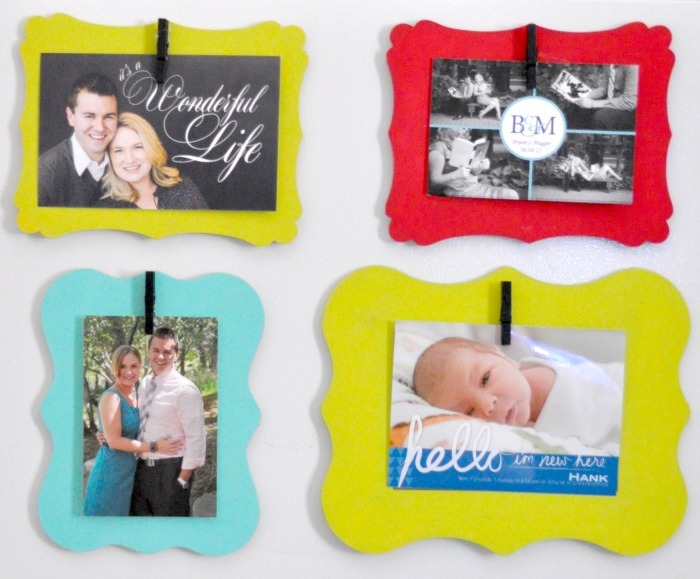 Ok, I”m so not the crafty type and I think I want to make these! Looks like something I could manage and they are SO cute! These are so cute! I need to make some for my fridge, I love it! Those are so adorable. Very neat way to tidy up the front of the fridge. These are so adorable! I really would like to do something like this on my fridge but I know it wouldn’t last with my boys in the house. They certainly add some personality and fun to the photos! What a great idea, my fridge is a hot mess full of clutter, this looks nice and clean. Those are adorable! My desk makes me CRAZY- because it’s in the main area, and everyone plops stuff on it. Makes me crazy! Those are so cute! They make a big difference in the look of a cluttered fridge! How cute! Those are an awesome alternative to the normal random fridge magnets. I love how you can added clothespins so you can change the pictures over and over. They turned out great! Those are super cute! I would love to cover my fridge in some of those.